One of the most moving scenes in William Wyler’s epic film about returning war veterans appears only minutes into the start of the film when Homer Parrish (Harold Russell), a disabled Navy veteran who lost both hands in the war, is dropped off at his parents’ home by the two other vets from his hometown he just met at the airport. The two others, Sergeant Al Stephenson (Fredric March) and bombardier Fred Derry (Dana Andrews) remain in their taxi watching Homer as he approaches the house. He halts on the front lawn, feeling a sense of unease about what waits inside. It’s quiet, nothing happens for a moment, suddenly his kid sister Louella appears at the door, sees him, and excitedly runs out to greet her big brother. Homer’s parents are not far behind. They greet him, hesitant at first, his father then hugs him, his mother sobs, both tears of joy and sadness. They are soon joined by Wilma (Cathy O’Donnell), Homer’s girl who lives next door. Their eyes meet, they stand still for a second and then she hugs him. Significantly, Homer does not hug her back. 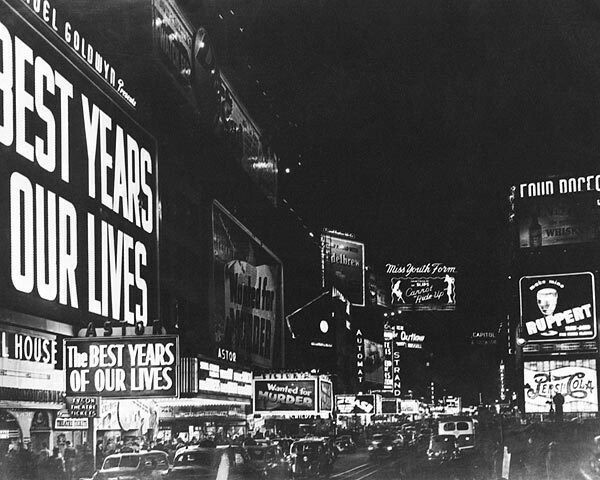 Surprisingly, or maybe not, “The Best Years of Our Lives” has not dated at all, in fact, it remains extremely relevant to our lives today. Sadly, since World War II, we as a country have been involved in wars or ‘conflicts’ seemingly one right after another. Korea, Vietnam, Iraq, Afghanistan being the major engagements and there have been numerous others, too many to list. In each case returning soldiers have faced emotional and physical adjustments and sometimes, like during the Vietnam War, were greeted with protests and indifference. Wyler, along with screenwriter and playwright Robert E. Sherwood, reflect on these transitions accurately and bluntly in many scenes. However, there is one scene in particular I want to point out. It comes when Al Stephenson, now working as a loan officer at the bank he was employed at prior to entering the service, greets a customer who is requesting a loan. It turns out the man is an ex-G.I. and needs the loan to buy some land so he can start a farm. Al, as is part of the standard procedure for banks, asked him what kind of collateral he can provide. The young veteran looks back with a blank stare, he has no collateral. Al explains the bank needs to have some kind of security, a guarantee of sorts so they know they can get their money back. Dejected, the vet still could not understand why he was being refused. Al is painfully uncomfortable telling the young vet all this. He doesn’t want to reject the soldier’s request and eventually goes against the bank’s policy approving the loan. Later, attempting to explain to his manager why he did it, the sanctimonious boss goes on about, oh sure, we need to help the vets now that they are home, but we cannot be lending money to people with no collateral, after all, we’re running a business. It’s a poignant scene, as well as a dose of reality, one that will resonant with many people and veterans especially. Think of the recent scandals involving banks foreclosing on veterans’ families while they were still serving their country! Based on a novel in verse called “Glory for Me” by Mackinlay Kantor, “The Best Years of Our Lives” follows the lives of three returning veterans, Fred Derry, Al Stephenson and Homer Parrish. Fred, a heroic bombardier is now facing dead end jobs, unemployment, a slutty wife (Virginia Mayo) only to soon find true love with Peggy (Teresa Wright) the daughter of Al Stephenson, the former Sergeant and now a bank executive. Stephenson finds his cushy successful civilian life hard to accept, almost contemptible. Al drinks too much, trying to forget the horrors he was forced to endure in war. Al finds himself not as concerned with success but empathizing more with his fellow veterans. Then there is Homer who is handicapped , having lost both his hands in an explosion. He doesn’t want pity, nor to be treated as a helpless invalid. Still living with his parents, the transition to civilian life is difficult especially with his girlfriend Wilma (Cathy O’Donnell) whom he planned to marry prior to the war. Now, things are different. Wilma still loves him however, Homer holds her at arm’s length, not wanting her to get involved with him, not wanting her to be stuck with a cripple. For all three returning veterans nothing can ever be as it use to be. Both the novel and the final film are bleak visions of returning vets. Kantor’s original draft submitted to Wyler and MGM had an even darker vision of the post war tribulations the three veterans would be facing. In the novel, Fred Derry’s return to private citizen is met with a cheating wife right up front and no work. Without a job, Fred thinks about robbing a bank, the same bank where Al Stephenson works. Al, whose cushy life at the bank making loans to returning veterans is morally more difficult than he thought attempts to reconcile business ethics with his new found social consciousness. A former serviceman, now a farmer wants to make a loan to buy some land to farm however, he has no collateral. Al makes the loan but faces the anger of the bank’s president for lending the money to someone who is clearly a big risk. Al resigns from the bank and forms a partnership with the veteran he made the “bad” loan too. The biggest changes though come with Homer, the handicapped sailor who returned from the war with two hands missing. In the novel, Homer was originally a spastic as a result of injuries suffered in combat. He finds it hard to coordinate his body movements except when he drinks, only then can he manage to find some ability to control himself. Sadly, he is on his way to becoming a lifetime alcoholic. Homer is also weary of his girlfriend, Wilma. They have been together since high school but he fears Wilma is only going to marry him out of pity. As Homer continues to drink his moods become worst, at on point, he even attempts to shoot his parents during an argument. Only Homer’s unsteady hands saved their lives. Homer eventually does come to realize Wilma’s love is not from pity when she begins to read up on Homer’s condition and tries to help him get through it all. In the film Homer is no long a spastic, this after Wyler heard about Harold Russell, a real life veteran who lost both of his hands in an explosion while training paratroopers at Camp MacKall in North Carolina. Russell later made an Army training film called “Diary of a Sergeant” which Wyler happened to see and he soon after signed him for the part. Other changes involved Fred Derry, no longer planning to rob a bank; instead he went back to his dead end job at the drugstore. In the final film, Fred and his wife try to make a go of their marriage at first, but it doesn’t work out, she wants to party and finds another guy (Steve Cochran) to party with. As for banker Al Stephenson well, he stays with the bank, still gives the loan to the vet but does not quit, nor does he form a partnership with the Vet to farm. For director of photography Greg Toland this was his sixth and final film with Wyler and like most of Toland’s works it most impressive. His deep focus photography helped Wyler convey a sense of realism and grit. He also avoided using any kind soft glamorous lighting in order to add a touch of reality and less movie star perfection to the actors. For example the actresses, though all beautiful (Myrna Loy, Theresa Wright, Virginia Mayo and Cathy O’Donnell), come across as attractive but still everyday kind of women you could possibly meet in real life. In addition to the realistic photography, Wyler and his set designer paid close attention to small details like the clothes the women wear making sure each piece looked proper for the characters they portrayed. Again, there is nothing glamorous about the wardrobe; it all looks like it came right off the rack. Wyler’s use of the camera has always been subtle; his point of view always focused on the story, the audience connected by what is unfolding on screen. This is unlike Welles or Hitchcock who use the camera to record extremely personal shots, basically forcing the viewer to see exactly what they want you to look at. Whereas Wyler sets the camera down and lets the scene unfold giving the viewer a choice on where or what to focus on. A good example is the wedding scene of Homer and Wilma. As the scene unfolds Theresa Wright is in the foreground during the ceremony. In the background, also in focus, thanks to Greg Toland’s deep focus camerawork, is Dana Andrews, their eyes making contact. This is all in one shot and Wyler gives the viewer the opportunity to look at whoever they want and when. A result of this technique is Wyler’s films contain longer takes with less editing. Wyler’ long takes, his craftsmanship, his seriousness that critics once acknowledged as William Wyler’s greatest attributes, later in his career became handicaps and targets for attack by some critics. In the 1960’s and up until 1970 when he made he made “The Liberation of L.B. Jones,” his work began to be viewed as out of fashion, some were considered overblown and his position was not helped with “Funny Girl,” a film so tailored to Barbra Streisand’s talent one wonders whatever happened to Fanny Brice. 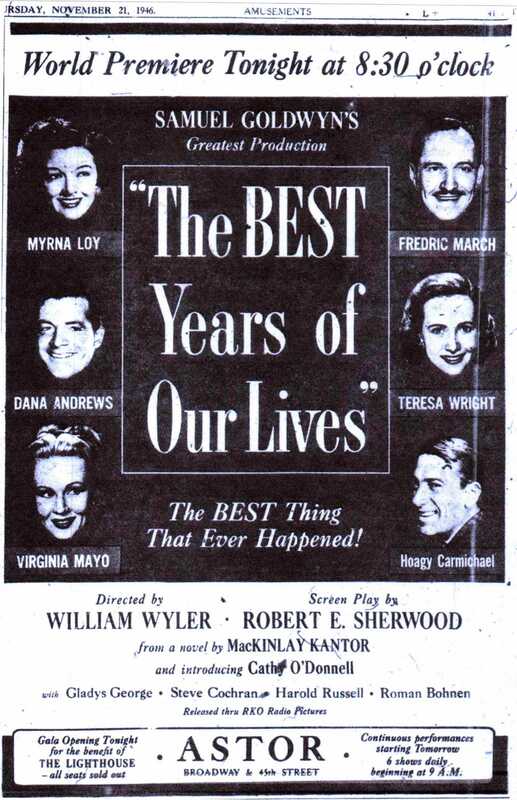 While I know many will disagree with me, “The Best Years of Our Lives,” is Wyler’s most fully realized film and I believe his most personal too. Having just come home from the war, he wanted to make something that had depth and meaning to it. He found it in this powerful story of men returning from the horrors of war as they attempt to assimilate back into civilian life as best they could after facing death and destruction. The film was originally scheduled to open in 1947 but Wyler convinced MGM honcho Sam Goldwyn that it had Oscar potential and should open late in 1946 to qualify. The world premiere was held in New York on November 21st when it opened at the Astor Theater on Broadway where it played for more than eight months straight before being distributed to other theaters throughout the city. On Christmas day 1946, the film premiered in Los Angles at the Beverly Theater. 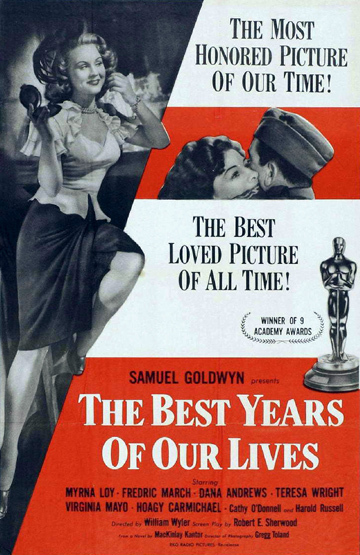 By year end “The Best Years of Our Lives” was crowned the best film of the year by the New York Film Critics and would soon after receive eight Oscar nominations winning seven including Best Picture, Best Director, Best Actor (Fredric March) and Best Music Score by the great Hugo Friedhofer. The biggest shocker was that Greg Toland did not even receive a nomination for his impressive cinematography that contributed so much to the film’s look and feel. Harold Russell who won for Best Supporting Actor also received a second special Oscar for “bringing hope and courage to his fellow veterans through his appearance in The Best Years of Our Lives.” The film was also a financial hit with the public, this despite the fact it was one of the more serious works to come out of Hollywood, one that challenged the audience to come face to face with problems still fresh on everyone’s mind. After all, it was only one year after the war ended that it came to the screen. Over the years there have been many films that have focused on returning soldiers coming home with uncertainty or shelled shocked, battle fatigue, post war syndrome, call it what you want, in works like “Coming Home,” “The Deer Hunter,” “Home of the Brave,” and most recently, “Stop-Loss” and “The Lucky Ones.” “The Best Years of Our Lives” was one of the first films, if not the first, to focus on returning veterans coming home, adjusting to civilian life. While it may be a bit too long, to this day it still remains one of the moving works of its kind. This entry was posted in 1940's, Film Reviews, William Wyler and tagged Cathy O'Donnell, Dana Andrews, Fredric March, Greg Toland, Harold Russell, Hogey Carmichael, Myrna Loy, The Best Years of Our Lives, Therea Wright, Virginia Mayo, William Wyler. Enjoyed your write-up immensely, John! I was especially interested to learn about the original character of Homer in the novel and the way it differed from the film version. I’ve never been a huge, huge fan of this film — I don’t know why, maybe it was just too painfully real? — but I certainly appreciate the performances, the story, and now, the direction, too! It might be film thatis uneasy with some folks because it deals with real issues that hit or can hit close to home for many of us. The Homer character, as originally written, would have really been depressing to see. John, this is one of my all-time favorite films. I’ve loved it from the first time I saw it 30 years ago on late-night TV and I still love it today. It’s a film that doubles as a perfect snapshot of our country at a specific point in time. The fact that the film doesn’t back down from so many different issues — think about Fredric March’s son’s reaction to March’s “souvenirs” from the war — is a credit to Wyler’s willingness to understand the many emotions beyond the post-war euphoria of returning veterans. The acting is brilliant — arguably Wyler’s best ensemble ever. I could go on and on … but you’ve already done a terrific job of looking at this movie. Thanks! CFB, I think you got this film pegged exactly right. It must have resonated with the public at the time with so many soldiers coming home from the war. Powerful film that has lost none of it strength. Thanks!!! One of my favorite films, and I think one of the best films ever made, if not the best. So much depth told with such elegant simplicity. Thanks Jacqueline – For me, this is Wyler’s best movie. I am sure others will disagree. It’s also most likely his most personnal film having just returned from the war which affected him so much. Thanks for your excellent post on what is one of Wyler’s greatest films. His use of depth of field, as you note, gives exceptional realism to his story, and allows it to unfold in a more natural, contemplative rhythm. His technique really works well for the narrative here, as it lets us focus so much on the inner lives of the 3 veterans, and why it still resonates today. GOM – Hew was a master craftsman and a artist. Thanks so much for the kind words. John, it’s clear that you went all out to write a post that expresses your strong feelings about this film. The film itself arouses strong emotional reactions, probably more so than any of Wyler’s movies. I think that’s because it’s so obviously his most personal. He was a great film storyteller, and you discuss why when you talk about his technique and style. But there’s a big difference between the period authenticity and dramatic situations of most of his other well-known films and the contemporary social authenticity and passionate tone of this one. It’s about the only “issues film” of his I can think of, yet it never seems obvious or preachy. That, I think, is because he keeps his emphasis firmly on the human elements of the story. As I read your discussion of the differences between the film and book it’s based on, I couldn’t help thinking that every change made for the film was for the better. The book sounds more melodramatic and schematic than the movie and more didactic. In the film we really get emotionally involved with the three returning soldiers and their families. The film interweaves the three plots (and some subplots that arise from these) quite skillfully, an ambitious approach for the time and one that seems very modern to me. 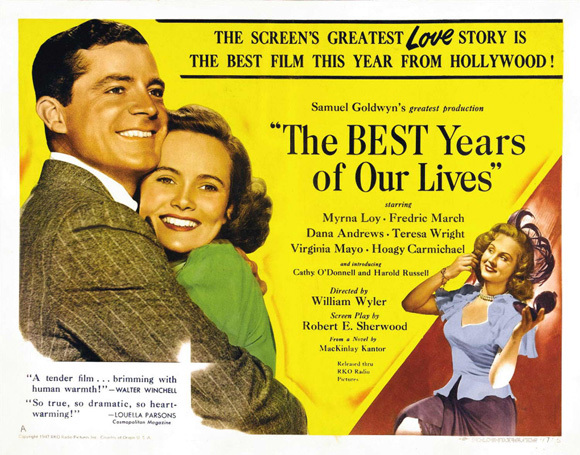 “The Best Years of Our Lives” isn’t quite my absolute favorite Wyler movie, but it’s certainly the one I most admire. Many movies have been acclaimed in their day for capturing the spirit of their times, and many of these seem like relics today. But I would say that this film is just as potent today as it was in 1946. That’s because it’s so honest and true and tells its story in a way that anyone of any era can relate to. It really shows us what it was like to live then and there, and that’s an astounding accomplishment that your post captures beautifully. R.D. – The only other film that I can think that was a ‘social issue’ film was his last, “The Liberation of L.B. Jones,” a race related film that failed at the box office. I have not seen the film since if first came but really would like to take another look at it. You right about the human element in the film stopping it from becoming preachy. 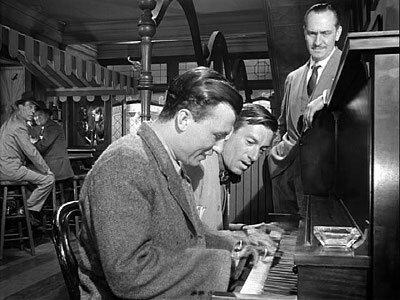 Wyler and his screenwriter make you relate and care for these three guys without becoming maudlin. I agree the script was an improvement over the novel. The change in Homer from a spastic to a paraplegic I thought was important. It’s sad enough seeing this guy come home with his hands missing. To watch an uncontrollable spastic may have been too much for most audience’s. For me, one of the most moving films about paraplegic vets is “Coming Home” with Jon Voight. I am aware of Brando’s film, “The Men” which I, surprisingly even to myself, have not seen. Absolutely, this film still remains as powerful as it was more than 60 years ago. Sadly, with all the wars we have had there is no shorter of soldiers returning vets and the problems many face. I also want to thank you for hosting this blogathon. What a great success! The quality of the postings has been superb, one excellent one after another. I never feel like I’ve watched “The Best Years of Our Lives”, I always feel like I’ve lived it. I have observed the emotionally powerful film makes its impact on all generations. It is truly one for the ages. Thank you for the background on the novel to screenplay. I am ashamed to say I have yet to read the source material. Patricia – thank you very much. This is certainly one of the most powerful and personal films to come out of classic Hollywood. Great write-up John. I agree that this movie hasn’t become dated at all. I remember seeing it when I was young and it had an incredible effect on the way I looked at others who were coming home from wars (and “conflicts”). I love many Wyler movies, but this one is certainly one of his best and my favorites. Thanks for the post. Thanks for stopping by. Glad you are in agreement. This movie ranks among the few films I thoroughly love, yet find very tough to revisit. It’s so very moving that it just wears me out. I have waterworks throughout the whole thing. Your post recalls a great many of my favorite sequences and I especially liked learning about the source novel and how it differed. Thanks for an informative and entertaining post. Thanks Ken and welcome to 24frames. The film does have a strong emotional impact and the ‘waterworks’ is understandable. This is a great film, John, and you have done a great job here – fascinating to learn more about how it was made and the changes from the book. Must agree that the whole sequence about giving the loan to the man with no “collateral” is a memorable part of the film, so I was interested to learn how this was changed. Another good film about veterans coming home, from the previous year, is ‘Pride of the Marines’, with John Garfield as a man blinded in combat, based on a true story – I’d recommend that one too if you haven’t seen it. Judy, thanks very much. I have seen PRIDE OF THE MARINES but it was so long ago I remember nothing about it. John Garfield though is an actor I have always liked. Maybe with our July 4th holiday coming up one of the TV stations will broadcast it. I really enjoyed your look back at TBYOOL. The first thing that stood out was your mentioning that the female leads ‘come across as every day women”. I couldn’t agree more! The casting was perfect in achieving that. Thanks for pointing out that this was the first film to deal with life after returning from war. I’m sure it must have been very raw, hit home to what the audience was going through at the time. I know that when I think of this subject matter I immediately think of Coming Home and the Deer Hunter. (Both so heart breaking but they had to be made) Until you reminded me of TBYOOL I wouldn’t have thought about it in the same way. So thanks for that! Thanks for adding all of the behind the scenes trivia and Wyler’s decision, insight on when to release the film. It deserved all of it’s Oscar nods. Another well thought out and heartfelt review, John and a wonderful contribution to the Blogathon. Thank Page. With the war still fresh in everyone’s mind back then I am sure the film hit home with a lot of folks. For many it must have been like watching variations of their own lives up there on screen. I think Wyler and the film definitely struck a nerve. Thanks again!!! John, I never connected with this film, as I’ve stated on other threads, and it remains the one celebrated Wyler film that to this day perplexes me. The adoration, the undeserved Academy Awards for March and the film in the year of Jimmy Stewart, IT’S A WONDERFUL LIFE, GREAT EXPECTATIONS, NOTORIOUS and Cocteau’s LA BELLE ET LA BETE, has always amazed me, but I am at least humble enough to concede that I am the problem here, not this universally revered film, which struck the right chord with post-wartime audiences, and provided a realistic view of the difficulty of adjusting and the confusion and uncertainty that informs an aimless progression. There’s no doubt that Greg Toland’s deep-focus cinematography is striking, and that the much-underrated composer Hugo Friedhofer has written one of the most distinguished and provocative scores of the 40’s and the magnum opus of a career that also includes excellent scores for ACE IN THE HOLE, THE BISHOP’S WIFE and THE SUN ALSO RISES. (I am in fact right at this moment listening to the score in my computer room on the CD, and I am seriously pondering the possibility of voting it the best score of 1946 this week over George Auric’s LA BELLE E LA BETE, but it’s neck and neck). The composer’s deft economy of expression and lovely main theme immediately establishes a tone of optimism, making marvelous use of the French horns. Like the greatest scores, the music speaks a language of it’s own, and as a stand alone its a sweepingly beautiful classical infused work. So then, what’s my problem? I honestly can’t say anything that will put to rest my indifference through the years. The movies narrative arc was always rather a bore to me, the ending fraudulent (compare it for example to the last scenes of THE DEER HUNTER, disturbing but seemingly accurate) even if boredom is actually ingrained in the subject matter. March was solid enough, but his great acting was behind him in the 30’s with the single exception of DEATH OF A SALESMAN, and he didn’t deserve the Oscar and New York Film Crtics Circle Award he won, certainly not over James Stewart and his iconic portrayal of George Baily. Similarly, Russell’s win over Claude Rains was more symbolic that predicated on actual talent. But awards aside -and that is hardly what I should be discussing here- the cast can’t really be faulted. But my issues are a small ripple in an ocean of positive regard, and one day I may yet realize my folly. Certainly, your magnificent and impassioned essay here is one of the crowning jewels of R.D. Finch’s great project, and it’s in the service of a film that many regard as Wyler’s masterpiece. Your framing of Wyler’s singular artistry and meticulous attention to detail is seamlessly ingrained in this utterly remarkable assessment. Russell’s award could have been a sympathy vote. The Academy has been known for that as you well know. NOTORIOUS is a masterpiece but again Hitchcock back then was not taken that seriously and here Wyler was dealing with a serious subject that affect just about everyone. I admire this film because, being a vet myself, it strikes a cord. Even though it was a different war and a difrerent time many returning War Vets have alway had a rough time coming home in one fashion or another. It could be injuries, emotional problems, family issues, jobs, there are a host of problems the vets over the years have faced. Now not every vets has been affected but many have. i think that’s what resonates with this film. Believe it or not, I have not seen GREAT EXPECTATIONS nor the COCTEAU film. One i do maybe would have more of an issue. Thanks again for a great comment here. John, You reflect on “The Best Years of Our Lives” with a nice balance of analysis and contemplation. You are probably right in suggesting that this is Wyler’s most personal film – not only he had just returned from the war but, similar to Homer/Howard Russell, had suffered a major injury – the loss of his hearing. I didn’t realize until recently how profound his hearing loss was and how deeply it affected him, psychologically as well as physically. Like many “baby boomers” I grew up with a father and uncles (all of them) who served in WWII. It was called “The War” and seemed the singular common experience that connected everyone alive at the time and old enough to remember it. For my generation, WWII was the stuff of myth. I doubt that those who fought in the war experienced it as mythic while in it – certainly not my dad or his brother who found himself dog-paddling in the Pacific after his ship was sunk. 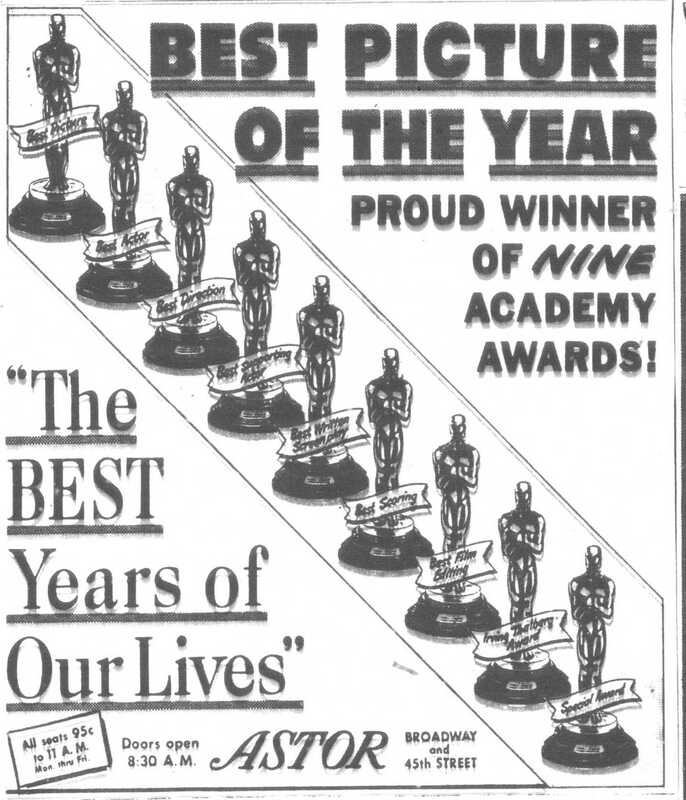 “The Best Years of Our Lives” spoke directly to those who served in and lived through that particular war in powerful ways that other “war films” of the era did not. Which is a rare accomplishment. I completely forgot about the loss of hearing which I would have included somewhere. Thanks for bringing it up, I think its important. The second World War seemed so different. It seemed that generation was connected somehow to it all, men and women. I had an Uncle who was in Pearl Harbor when the Japanese attacked and he never really talked too much about other than to say it was mess and that he was missing at one point and presumed dead. They even notified his parents that he was dead. Like all wars, it must have been a horror. Lovely post. I find this film impossible to resist. Although I am not a real fan of the war at home and abroad movie, this in one that is perfectly realized.. It’s power to move has not dimmed. Whenever there is a poll about war films, this always tops the list. Thank you FlickChick! I can understand some folks resistance to war films but glad to see you appreciate this work. I consider The Best Years Of Our Lives one of the three essential War On The Home Front movies. The others being Since You Went Away and Pride Of The Marines. All three films are emotional and heart felt. The films took place during a special time in America where self-sacrifice and patriotism were an essential part of every American’s life. Thanks for the essay. As I mentioned in an earlier comment on this thread, it has been a long, long time since i have since PRIDE OF THE MARINES so I cannot comment. As far as SINCE YOU WENT AWAY, I have not seen it. But you are right, during the War, patriotic films were part of the war effort in some small way. The films filled a need for the folks back home while husbands, sons and fathers were fighting. Fascinating background on the difference between the book and the movie. Sounds like the changes were for the better. I also think this is one of the greatest films ever made, and 1946 was a landmark year in so many ways. All those returning professionals eager to resume their craft with the war time experiences used to create more mature forms of expression. I think the film is still relevant. The clothing styles and grammar may change, but the themes are universal. It could be Dana Andrews’ best performance,and one sadly underrated. Everyone is at the top of their game here, both in front of and behind the camera. 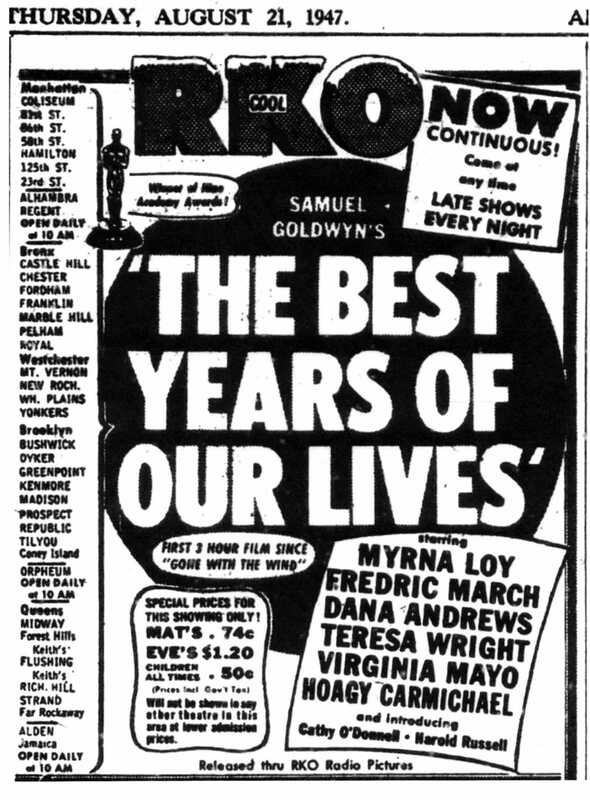 There are many, many Wyler films I adore, and think are some of the greatest films ever made, but “The Best Years of Our Lives” is the one where everything comes together. The themes are sadly still relevant with one war after another. Andrews is an actor i have come to admire later in life. He is terrific here as you mention and also in so many film noirs that he made over the years. As I mention in the essay, I personally believe this is his most personal film as well as one of his best, if not his best. Thanks! I had seen bits and pieces of the movie over the years, and the other day when it showed up on cable, with no commercials, I stopped channel surfing and caught it from about fifteen minutes in. My wife came in and asked what it was (she is younger and doesn’t tolerate old films too well)…I explained what I knew about it, then had to leave to return to my work studio (composer) as I was on a deadline. I came back about 20 minutes later and she was standing in the middle of the room still watching. The next time I came down, she had pulled her chair up near the TV and was telling me “Shhh!”….she was engrossed. I ended up watching the rest of it with her. She cried at the end, and it was tough for me as well, especially in the scene where Myrna Loy talks about the rough spots she and March had endured in their marriage. Wonderful scene. I instantly renewed my crush on Teresa Wright and was just enraptured by Cathy O’Donnell, who to me was downright haunting. I’ve spent the last few nights reading everything I could find on her! Stunning film, perfectly cast, amazingly shot and edited, timeless. Next… I have to see it from the beginning to catch those missing first minutes. Thanks for sharing this wonderful story. THE BEST YEARS OF OUR LIVES still holds up as one of the best films of its kind. Director Wyler and the actors get you to feel the characters to the extent that you feel like you know them and their pain. Hopefully, your wife will give other B&W films a chance also. There are a lot of great ones out there.